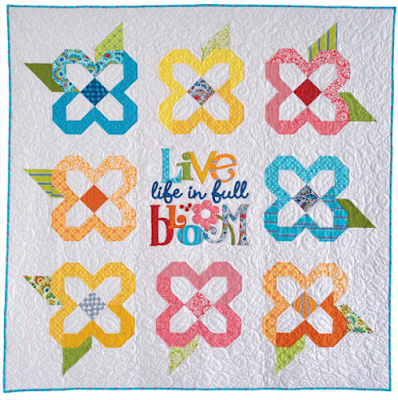 We're featuring a second quilt showcasing Nancy Halvorsen's Bree collection today. This quilt, designed by Nancy herself, is featured in the March/April issue of McCall's Quilting. The quilt, called "Live Life in Full," is certainly full of whimsical charm! Read below to find out what Nancy has to say about her quilt. 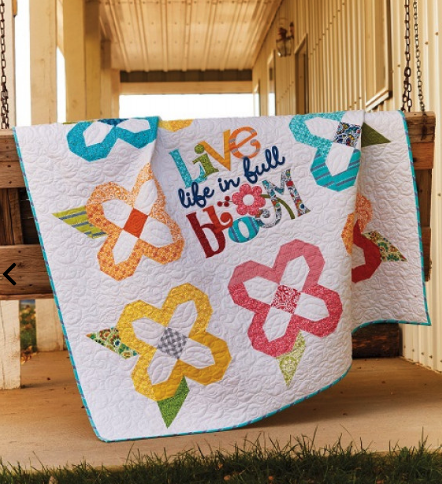 Read below to learn what Nancy has to say about her quilt. Can you tell us about the quilt’s message? I knew this issue would come out in spring, so I was trying to think of something to do with flowers and spring time. I love to come up with positive uplifting messages. 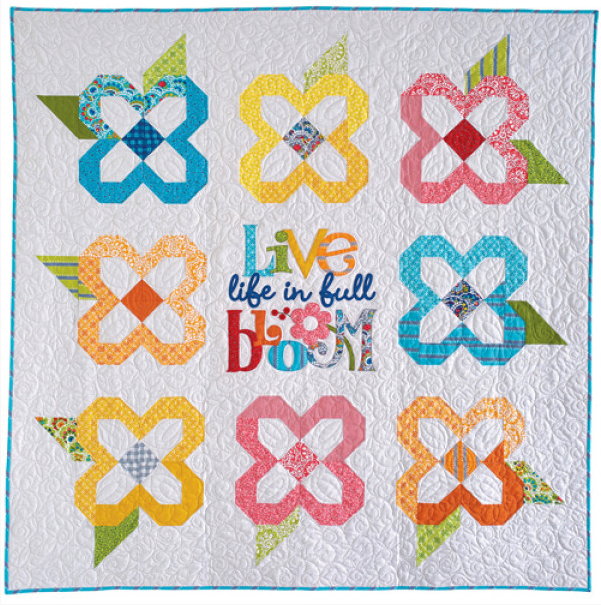 I thought “Live life in full bloom” would be a fun, happy idea that I could mix in with the flower blocks. The flower blocks go well with the style of the text. I actually designed this block years ago and reworked it for this quilt, adding the white centers to the petals. 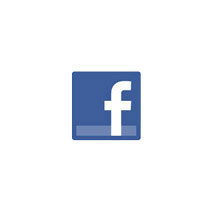 The white keeps it bright and fresh without detracting from the center block. I gave the flowers a scrappy look because I love to give things texture—it’s more interesting than just using one fabric. I tried to use as many prints as possible because they’re so fun together. Did you have fun making the letters? Yes! I wanted the letters to look like a garden—lots of different colors. The second “O” in bloom is a flower with a stem. I’ve been doing that type of thing for years—I love to take letters in a word and turn them into what the word is talking about. What do you like best about this quilt? I love how bright and cheerful and uplifting it is. To me, it’s a perfect lead-in to spring. Spring always makes me feel happy after slogging through winter. Can you tell us about the machine quilting? Catherine Timmons is is so awesome. She does all of my quilting for me. She does the cutest things. Sometimes I will give her direction but this time I just said “do your beautifulness.” And she did. Click here to see Nancy's entire Bree collection. Click here to see more of Nancy's work. Click here to purchase the digital pattern. 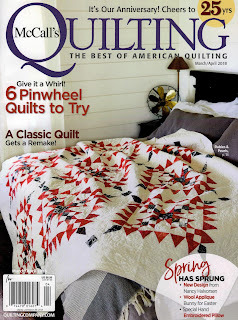 Click here to find McCall's Quilting magazine. AP&Q Podcast with Pat Sloan! Win a FQ bundle of Pansy Noir!